The Bradford Rattlers continued their winning streak to improve their record to 3-0-1 through the early part of the GMHL Regular Season. Bradford has won three games in a row to sit second place in the Central Division. The latest victory was a dominate 11-3 victory over the Grey Highlands Bravehearts Sunday evening at the BWG Leisure Centre. Bradford broke out with five first period goals and cruised to victory through the second and third periods. 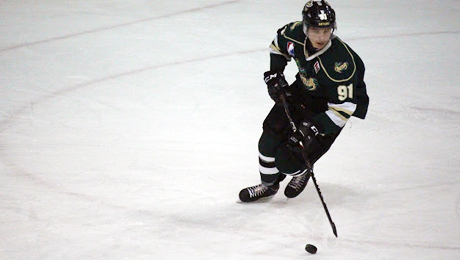 The youngest player on the Rattlers, Egor Kurbatov, 16, from Russia lead the way offensively. Egor was the games first star scoring three goals on the evening. His Russian counter-part and second year Rattlers Khassan Al-Dzhilaui had four points of his own including a goal and three assists. Newly appointed Rattlers Captain Devon Fullum had three points of his own in the match while Bradley Hampton picked up the victory in goal. Goal scorers for the Rattlers included: Kurbatov (3), Brunnberg (2), Larsson, Eccles, Shea, Lang, Senecal and Al-Dzhilaui. The Bradford Rattlers will take on the Shelburne Sharks next Sunday, October 4th at the BWG Leisure Centre. Puck drop is 7:30pm.